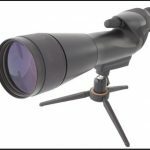 Home » How To Guide » How To Decide Replace or Repair Spotting Scope? A spotting scope or terrestrial scope is a miniature sized astronomical scope. A spotting scope is mainly preferred by bird watchers or animal lovers. It is widely used by field scientists to spot animals. But those interested in astronomy can also use it with ease. But like other telescopes, spotting scopes also fail to work sometimes. That is when users confused whether to replace the spotting scope or repair it. One has to make a number of considerations, before replacing or repairing a spotting scope. After following some simple steps, you will be able to make a clear decision on whether to replace or repair your spotting scope. There are 2 kinds of eyepieces for spotting scopes, fixed and zoom. These eyepieces are usually interchangeable. Eyepieces normally come with a magnification power of 15x to 60x. Most high-quality spotting scopes models do not come packed with an eyepiece. In this case, the eyepiece has to be bought separately. This is the part that contains all the coated and processed lenses and is the central part of the spotting scope. This part is essential for protecting the spotting scope from rough weather conditions. It helps cover the eyepiece and the body of the spotting scope. Most spotting scopes have a supreme optical quality but lack proper stability. This is where a tripod comes in handy. It helps the user keep the scope steady and balanced. The above parts are some of the things to look at if your spotting scope ever malfunctions. It will help you make a better decision on whether to fix the scope or just replace it. The type of spotting scope you are using: there are basically 2 types of spotting scopes. They are straight or angled bodied spotting scopes. Straight bodied spotting scopes are can be used from inside a car and are mainly used by bird watchers to spot flying birds. Angled body spotting scopes do not need height adjusting and can be used to spot a group of birds from afar, just by leaning a bit towards the eyepiece. The tripod can be fixed in a lower position, and the user can spot birds in a more relaxed fashion. Normal coated: These lenses have partially treated lens surfaces. Full-coated: All the layers of the lenses are coated perfectly with anti-reflective layers. Multi-coated: These lenses have 1 or 2 magnesium fluoride coated layers. Fully multi-coated: Nearly all the layers of the lenses have been coated with specially treated chemical compounds. 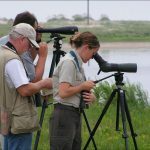 The spotting scope is an essential instrument and tool for animal spotters and bird watchers. But as like any other telescope, they will definitely malfunction after extensive use. When you are using a spotting scope for a long time, you will have an idea of its every nook and cranny and how it works overall. When you know how each part of the spotting scope functions, it will become easier for you to fix it. Below we’ve listed down some of the most common problems that you may face with your spotting scope. This is mainly due to a defective lens. Animals or birds far away might look like a big blob. Sometimes the lens gets foggy due to weather conditions. Perspiration gathers up on the lens and makes objects seen through it look blurry. In this cases, it’s better to replace the eyepiece and lens with a better-known brand. This is due to the lens being misaligned. If you are constantly adjusting the magnification of the lens, soon it will get misaligned. The inner lens sometimes gets lose due constantly moving around with the scope. But most of the times its cause of silly matters like keeping the lens cover on. If you’ve just come out of a brightly lit room, don’t expect to see that much. The spotting scope does not properly stand on the tripod. Tripod legs tend to break if too much pressure is applied on them. Make sure none of the tripod legs are broken. Fixing tripod legs are possible. But getting a replacement would be more sensible, as the price required to fix one is the same as the price of a new one. A spotting scope is a very convenient tool for bird watcher and animal spotters. It can be carried around anywhere you desire. But sometimes wear and tear might occur. That is when one might face the dilemma of whether to repair the spotting scope or simply replace it. There are various factors that you must consider when determining whether to repair or replace a spotting scope. Here are some of those factors; they will serve as a guide, when in dilemma. Sometimes it takes a lot of money to repair a spotting scope. Sometimes the cost of repairing is more than that of buying a new spotting scope. Always compare the repairing price with the price of buying a new one. You will have to consider how severely your spotting scope has been damaged. Is it repairable or beyond repair. If it is repairable, it is best to consult with a professional. If it is not repairable even by a professional, it is best to replace the spotting scope. How frequently was the spotting scope used? If you frequently use the spotting scope than it is advisable to get a new spotting scope after your regular one is damaged. This is the cause; it takes some good amount of time to fix a spotting scope. 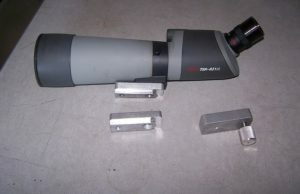 Some spotting scopes have parts that are not easily available in the market. If your spotting scope is one of this kind with rare parts, it is best to buy a new spotting scope. These factors will help you immensely to decide whether to repair or replace a spotting scope. Make sure, you choose the option which will be both budgets friendly and less time-consuming. Make sure your spotting scope has proper after sales service and warranty. Most expensive spotting scopes nowadays come with 2 to 3 years parts warranty or replacement warranty. Some well-known spotting scopes are actually renowned for their after sales service and warranty. How to DIY Repairs of the spotting scope? Many people believe that a spotting scope is maintenance free, but that is not definitely the case. Any spotting scope out there needs proper maintenance or taking care of. Still, some spotting scopes get damaged and thus need repair. Some repairs need professional hands, others can be done all by your own if you know the proper procedures. Here are some simple tips and DIY tricks to repair simple spotting scope damages. The lens must always be cleaned with a specialized lens cleaner. It could be the same one people use to clean camera lenses. A lens cleaner has to be used if the lens ever gets foggy or unclear. Totally avoid household window cleaners when cleaning the lens. This kind of substances actually damages the lens more. The spotting scope case needs cleaning as sometimes dust gathers inside the case, which may damage the scope eventually. Natural polish can be used to clean the case, as it keeps the case shiny and completely dust-free. If your spotting scope is not balanced you will not be able to use it for spotting. To make sure it is properly balanced, keep a look out on the tripod legs. If any of them are a little loose, they can be fixed by using some duct tape. Use a bit of cardboard and highly adhesive glue to patch up the cracks. The case will not look that good, but patching it up will keep the goods inside protected from dust or further damage. Damaged outer lenses on the front and on the eye piece can be replaced. Lenses are readily available at your local telescope store. Just make sure you get the ones with the right magnification power matching of your spotting scope. All the above DIY tricks mentioned above can be used to fix common damages and problems with your spotting scope. But more technical issues like totally misaligned lenses, misaligned sights, cracked internal lens and focusing problems can be fixed only by professionals. They can give you the right advice on whether to repair or replace the spotting scope or not.